It will has a fixed mode with RGB lighting effect. 1pcs CPU Air Cooler. You may short circuit your motherboard if you connect to other ports. Which will allow you to change the color as you like via motherboard. 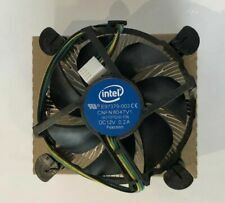 Used CPU cooler, great condition, perfect working order! The AMD Wraith Max represents AMD’s ultimate cooling solution for air-cooled processors. The Wraith Max is also compatible with AMD FX 4000/6000/8000-series processors (socket AM3 ) and AMD A-Series and Athlon Processors (socket FM2 ). 2pcs Aluminum Heatsink with fan for 5W/10W High Power LED light Cooling Cooler DC12V. Cooling; Avoid LED Overheat. Fit High Power Led 5 watt 10 watt. Material: Aluminum & Plastic. Gross weight: 45 g.
COOLER MASTER FA08025M12LPA 80mm 80x80x25mm DC12V 0.45A 8025 4pin Cooling Fan. There are fully tested working. REPLACES FOXCONN PVB070E12H-P01. REPLACES FOXCONN, DELTA & OTHER BLOWERS. NEW SUNON FAN (BLOWER). 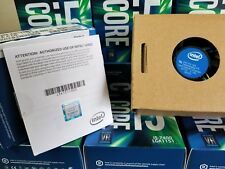 Intel E97379-003 Core i3/i5 Socket 1150/1155/1156 4-Pin CPU fan heatsink. Shipped with USPS First Class Package. Mfr Part Number: E97379. It has untouched thermal paste which was applied in the factory. CPU Socket Type: LGA 1155/ 1156/ 1150 / 1151. Connector: 4pin. Rated Current: 0.41A. Airflow: 77.1/91.4 CFM. Bearing Type: Dual Ball. AC Frequency: 50/60 Hz. Rated Current: 0.08 A. Life Expectancy: 70,000 hrs @ 40 Celsius. RPM: 1,450/2,900 RPM /- 10%. This is a used CPU cooler, but works without issue. This sale is only for the cooler and photographed accessories only, no other components are included. Vapor Chamber / 8 Heat Pipes / Aluminum Fins. New HP 13" Spectre X360 13-ae000dx ( 2017-18 Model ) Series laptop matched pair CPU Cooling Fans. ( New Version ). The item serial number may be difference of the photo. WE WILL MAKE IT. Hp 17-Series CPU Cooling Fan 767712-001 & Heatsink 773447-001, TESTED, FS! Speed: 2200rpm±10%. Can effectively cool your CPU. 1 Cooling Fan. Fan Size: 90 25mm(Approx.). Note: The real color of the item may be slightly different from the pictures shown on website caused by many factors such as brightness of your monitor and light brightness. 100% Brand new and High Quality.Four 6MM heat pipe design, superior thermal performance.Bottom CTT process and improve the efficiency of heat transfer.9 cm quiet black-rimmed leaf fan, highlight DIY personality.Fan size:92 x 92 x 25mm.Bearing type:Hydro bearing.Rated Voltage:12V DC.Start Voltage:7V DC.Operating Voltage:10.8-13.2V DC.Rated Current:0.17 /-10%A.Input Power:2.04W.Fan speed:2000 /-10% RPM.Noise:28.1dB(A).Maximum air flow:41.67CFMFit for :Intel Socket 130WLGA1156/LGA1155/LGA1150/LGA1151/LGA775.Core i7/i5/i3Core 2 Extreme.Core 2 Quad.Core 2 Duo.Pentium/Pentium G.Pentium D/Pentium 4.Celeron Dual-Core.Celeron/Celeron D.AMD Socket 130WFM2/FM1/AM3 /AM3/AM2 /AM2/940/939/754.FX X8/X6/X4.A10/A8/A6/A4.Phenom II X6/X4/X3/X2.Phenom X4/X3.Athlon II X4/X3/X2.A. Trending at $16.92eBay determines this price through a machine learned model of the product's sale prices within the last 90 days. USED FOXCONN PVB070E12H-P01. REPLACES FOXCONN, DELTA, SUNON & OTHER BLOWERS. FAN (BLOWER) FOR HP 705 G1 DESKTOP MINI. NEW GENUINE HP SUPPLIER. REPLACES FOXCONN & OTHER BLOWERS USED IN THIS MODEL. Clean, removed from working Dell PC. Includes 4 rubber mounting studs. JMC/DATECH model number 9232-12HBTL-2. Add a copper heatsink cooler for a Socket 7/370 CPU for a 1U server. Connectors: 3-pin TX3. Connector Types: 1 x TX3 Female. Slim design CPU fan and heatsink cooler for 1U servers. Material: Copper Heatsink. Product Details: Genuine Dell original Desktop Front Fan Assembly for the Dell Precision Workstation T3600 / T5600 MDT Desktop system. Manufacturer: Parts For Dell. Ultra quiet powerful low-speed brushless DC fan. 1x Brushless DC Fan. size: 30mm x 30mm x 10mm. Used for Compact computer cases, power supplies ,DIY cooling transformation. Hard drive cooling. Graphics cooling. Dell 99GRF 099GRF Case Fan Sunon EE80201S1-0000-G99 DC12V 1.56W. Compatibility: For AMD 754 905 938 939 AM2 AM3 FM1 FM2 series. 10 x CPU Clamshell Tray Box. Quantity: 10pcs. Protect the CPU from ramming and bending the needle. G70 G50 G60 CQ60-200. CQ50 SERIES. CQ60 SERIES. This fan has Three Screw Holes. It will not fit. It can be used interchangeably. Hope you understand. 1x CPU Fan. This way we can satisfy your concern~! We will reply to you within 24 hours. Loc: Room202. BRAND NEW! 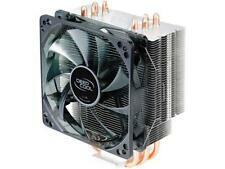 Cooler Master Hyper 212 Plus CPU Cooler 120mm PWM Fan RR-B10-212P-G1 . Condition is New still sealed, bought from Newegg and decided not to use. Shipped with USPS Priority Mail.